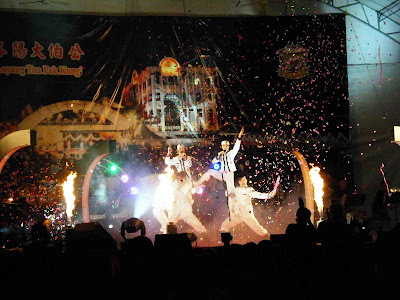 The Chinese Seventh Month Getai (concert) season this year is coming to a close tomorrow on the 19th September 2009. I had a very entertaining and fascinating evening attending one at Loyang Tua Pek Kong. 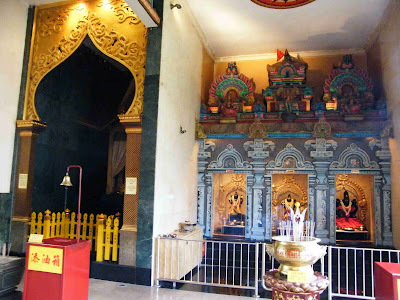 This temple is an epitome of religious harmony in Singapore. 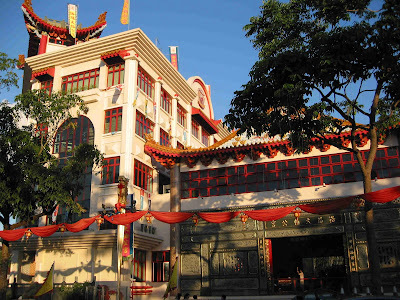 Besides being a Taoist temple, it also houses a Hindu Temple and a Malay Kramat (shrine). The Hindu Temple. Chinese devotees pray here too! Here is the Malay Kramat next to the Hindu shrine. 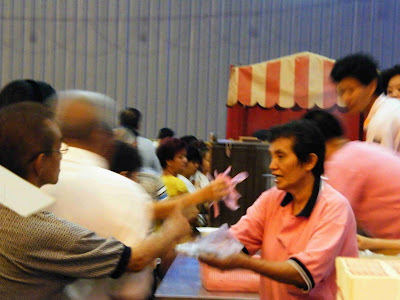 Besides opening the getai to the public for free, the temple also provide food for everyone. A big thank you to all the volunteers here seen dishing out the bowls of soup. This is the Baobei sisters. The stage is very posh for a getai. Artistes enter the stage from beneath, via an elevator platform. 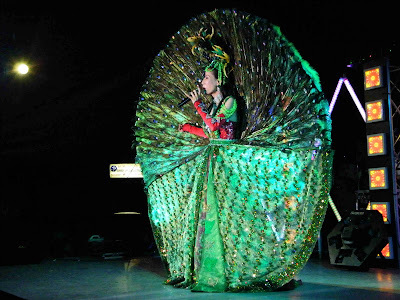 This is Karen Lim - the Getai Queen. 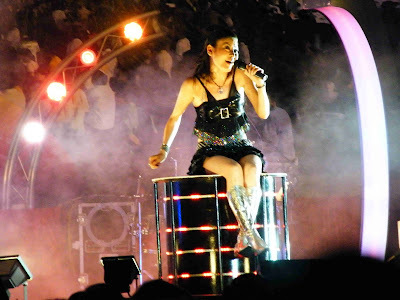 She has 153 getai engagements in 2008. That is more about 5.5 getais to sing at every night! She is a live wire and dances non-stop during her performances. This is a rare sight to see her seated. This is a 9 year old Malay kid who did a Michael Jackson dance. 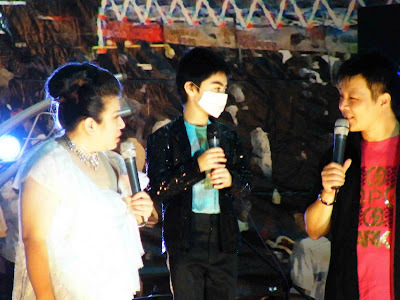 Here while bantering with the MCs Liu Lingling from Singapore and Lan Tian from Taiwan, he cheekily put on his mask, just like Michael Jackson used to. 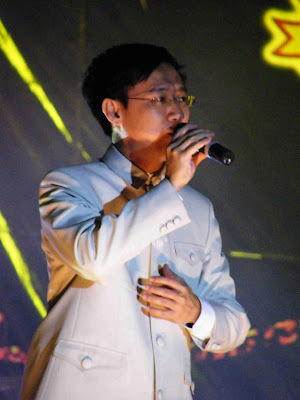 Mai Ke, an Indian singer from Penang sang in Mandarin, Hokkien and Cantonese. He is also a Michael Jackson impersonator. Oh! Now we have three impersonators! In case you can't recognise them, two of them are the MCs. This is Hei Mao (Black Cats) from Malaysia. 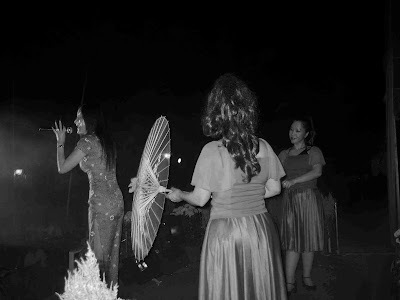 A three girl and two boy sing-and-dance group. Amazing feat stacking themselves and swing themselves around while singing. 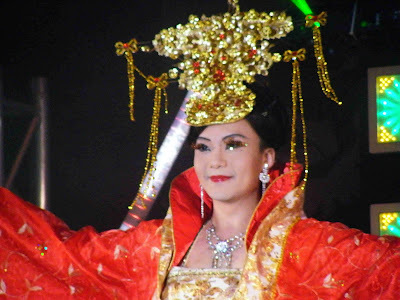 This is Fang Fang, our Malaysian 'Yau Shu Rong' (a famous female vocalist from Taiwan in the 1960s). At 58 years old, she still look great. She had ever said that she will continue to sing even when hit 60! This is so Singaporean. 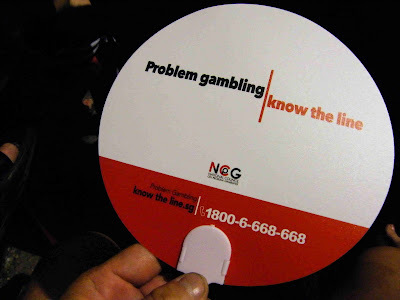 Dishing out fans with campaign slogans - about getting help for gambling addicts! This is to pre-empt gamblers getting into doldrums when the casinos are opened next year. Indeed seat reservation is a serious problem in some getais, as touts sell reserved seat enbloc and sell them for a few dollars each. 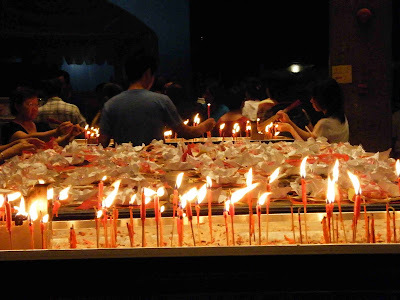 It was already near midnight, but devotees are still offering prayers at the temple. I enjoyed myself thoroughly in an evening of street culture and entertainment. A bit rough on the edges at times, particularly of those double meaning jokes banter between the emcee and the artistes, but such is the spontaneity of street culture. 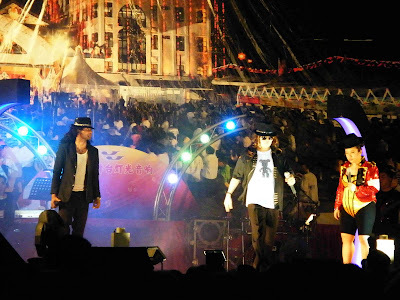 Particularly, the Loyang Tua Pek Kong getai is uniquely Singaporean in that there was so much diversity among the artistes from different countries, different religions and races. 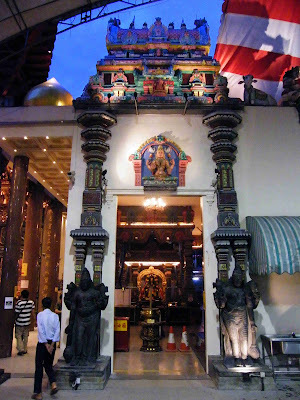 The temple premises itself houses a Hindu temple and a Muslim shrine. I think that is because Singapore is a confluence of two 'rivers' from the East and the West. Incidentally, this also goes for Singapore's ecosystem. For instance, there are about 60 known species of mangroves in the world and Singapore is home to 50 plus of them. Read here. For the coral reefs, the Great Barrier Reef which is about 6,000 times the size of Singapore has about 400 plus species and Singapore has 200 plus. Read here. For a small island of 660 square kms, there are just so many races and nationalities in Singapore. Some come as professionals to work and others to study. Perhaps this is Singapore's destiny, given its limitation of land size, it has learn to be open, adapt and innovate to prosper. He is known for his drags and ability to sing in both male and female pitches. Here's a video clip of 17 year old pole dancer Lim Zi Yee. Amazing how she can sing while up at the pole. There are more and more younger artistes coming on stage over the last two years. The youngest who is only 5 years old. For more pixs, click here. In the near future, they may have to continue to innovate and use newer entertainment technologies. May be there will be fireworks, pyrotechnics, more electronic music, more techno beats, holographic displays, large LCD screens for those in the far end from the stage, or even simulcasts on Youtube. Well, at the getai at Loyang Tua Pek Kong, pyrotechnics are already used. There are already many video clips on YouTube, though we haven't have simulcasts yet. Techno beats have already come together with rap and Michael Jackson gigs. 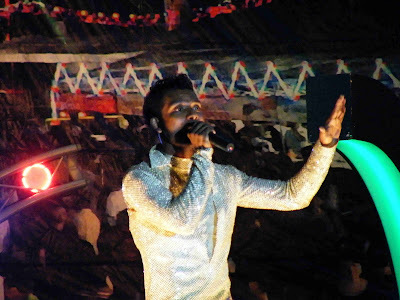 Younger artistes have also leveraged on the Internet and have facebook profile pages to communicate with their fans. Looking back, getais in Singapore have come a long way. Below is a pix (taken in the year 2004) of what getais used to be.